According to Internet Matters, around 72 per cent of children in Year 7 now have a smartphone. 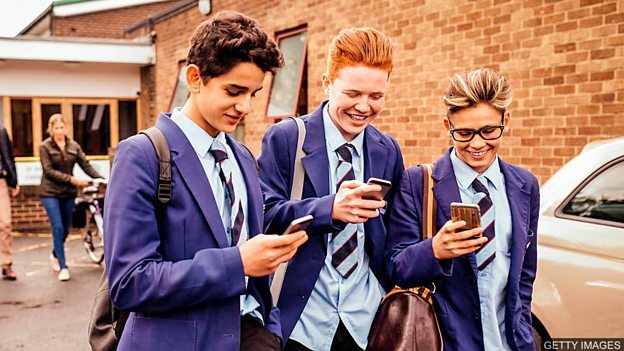 Of the 2,000 parents surveyed by the group, almost 60 per cent believe pupils shouldn't carry the device with them during the day, although 49 per cent were in favour of children being allowed to bring phones to and from school. In France, the government has intervened, approving a total ban on mobile use for pupils up to the age of 15. But here, some head teachers allow the controlled use of smartphones in class, maintaining that with budgets under constant pressure, they're an invaluable supplementary learning tool. 1. True or false? More than half of parents surveyed thought pupils should have their smartphones with them during the day. 2. What did 49 per cent of parents surveyed agree with? 3. When can pupils at French schools use their smartphones? 4. Why might school budgets in the UK mean head teachers allow smartphones to be used in class? False. Of the 2,000 parents surveyed, almost 60 per cent (more than half) believe pupils shouldn't carry the device with them during the day. 49 per cent of parents surveyed were in favour of children being allowed to bring phones to and from school. They can only use them outside school because the French government has approved a total ban on mobile use for pupils up to the age of 15. Some head teachers say budgets are under constant pressure – so they are limited and always being controlled so there is not much spare money to provide equipment.